Educated over 10,000 students about local food systems, natural building, and community-based sustainability. Undoing alienation from the natural world, TLC Farm engaged thousands of students, from preschool through grad school, in holistic approaches to food and land stewardship. Many of these young people have cultivated a lasting relationship with this land and TLC Farm mentors, providing them skills and connections to become change-makers in Portland and beyond. Hosted hundreds of workshops and skill-shares. From earthen building to herbal medicine, animal husbandry to social justice, the skills participants gained have led to creating successful new social enterprises, improving individual and community food security, supporting healthy and effective group process, and much more. Co-launched the first all-outdoor early education program in the country, now used as a model for similar programs nationwide! Over the last eight years, the Mother Earth School has provided an exemplary outdoor immersion program for preschool and kindergarten students, along with a summer camp for children of all ages. TLC Farm's unique access to farm and forest provides an ideal campus for these young children to engage and explore. Turned an unused field into the Village Green, which now serves as a venue for community gatherings of all stripes. Consisting of a massive cedar-shingled outdoor kitchen, 30-foot yurt with a back porch, butterfly-roofed stage, whimsical tea house, beautiful earthen sauna, and composting toilets, the Village Green has housed retreats and gatherings for dozens of diverse groups. 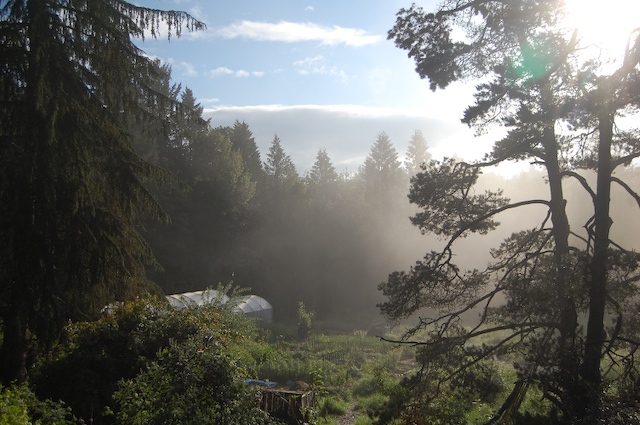 From housing advocates to mycologists, youth activists to religious communities, TLC Farm provides a unique and connective event location. Launched ReCode Oregon, which changed state law multiple times to allow for more sustainable building practices. Since 2007, ReCode Oregon has organized to change state and local laws for DIY sustainability practices. ReCode's first major victory was legalizing the reuse of graywater for irrigation in all of Oregon. It has since gained state approval for site-built composting toilets, and has been instrumental working with DEQ on decentralized wastewater treatment. Built all of our structures in educational workshops, using re-used or natural materials, and designed to weave the human environment into the natural world. Conversations in a round room, or in a space made from branches or earth, take on a different nature than those inside four walls with fluorescent lighting. We shape our buildings to reflect the beautiful fields and forest that surround us, and the buildings then shape our community connections. Hosted annual seasonal events that provide consistent opportunities for the public to connect with the land and each other. In addition to opening the land to visitors six days a week, over the last ten years TLC Farm has organized seasonal events each spring, fall and winter. These celebrations bring hundreds of people to the land to make new friends, learn new skills and simply enjoy this amazing place together. Successfully shared this land with several groups ─ a land trust, nonprofit & intentional community ─ and created a model that influenced dozens of groups nationally and internationally. Do you have any idea how many people call for advice? How to protect farm land from development, how to create legal and financial structures for multiple groups sharing land (as TLC Farm does with the Cedar Moon residential worker collective), and other aspects of creative land tenure -- we've learned a lot over the past ten years, and love to pass the knowledge on. Organized thousands of people to save this land from development, honored our commitment to repay the debts incurred in acquiring the land, and creatively navigated another major milestone with a social investment-based refinance of our mortgage. Your donation helped us protect this land, but almost half the funding for the land acquisition came in the form of bank loans. For 10 years, we have maintained the financial solvency needed to be in integrity with this debt. This past summer, we refinanced primarily through social investment, with an agreement that no matter what, the land can never be developed!